Overview - A famous Italian filmmaker, haunted by the memories of his first love, returns to his hometown after an absence of 30 years. Upon his return, he reconnects with the community and remembers the highlights and tragedies that shaped his life and inspired him to follow his dream of becoming a filmmaker. For those who have never seen it...and those who have never forgotten it...director Giuseppe Tornatore's (Malena, the Star Maker) cherished, Academy Award-winning motion picture is now fully restored, digitally remastered and includes 51 minutes of never-before-seen footage! There is a scene in Terry Gilliam's '12 Monkeys,' in which Bruce Willis' character watches Alfred Hitchcock's 'Vertigo' in a sparsely filled theater. At one point during the movie, Cole becomes distressed when he realizes he's seen the film before but can't recognize the scene playing. "The movie never changes. It can't change," he says, and then continues, "But every time you see it, it seems different because you're different." The sequence reveals a simple, but important concept. The recorded image is permanent, locked in a kind of temporal chasm outside our own shifting world, but we are not. We are all too transitory. The images themselves never change, but we do, and as we grow they take on new meaning. Our very experiences transform our perception. What once brought laughter may someday elicit tears. What once so greatly inspired may instead come to bitterly sting. What once shined so brightly through the youthful eyes of innocence may eventually hold more melancholy significance when we are old. The act of watching a film is not a one way street. Active participation from the viewer is required, and our relationships with the images on screen, or indeed all around us in our daily lives, are in a constant state of flux. A young man may look around at an apartment on a dirty street corner and see home, and an old man may return to that same corner and see nothing but cobblestone and trash, filling him with an aching longing for all that he's lost. 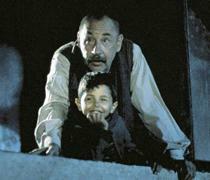 Giuseppe Tornatore's Academy Award winning film, 'Cinema Paradiso,' examines these very ideas. Through a bittersweet celebration of youth, growth, and cinema itself, Tornatore explores what is perhaps the most powerful and utterly devastating emotion of all… nostalgia. The story is told in flashback, as a middle-aged man, nicknamed "Toto" (Jacques Perrin), recalls his childhood in the small Italian village where he grew up. As a boy (played by Salvatore Cascio) Toto is enchanted by the films at his local theater and soon develops a close friendship with the projectionist, Alfredo (Philippe Noiret). Eventually Alfredo teaches Toto his trade and helps to foster his love for cinema. Throughout the changing times we watch as Toto grows up and deals with the hardships of love and loss, all while set to the backdrop of a rapidly changing world as evident through the shifting films that Toto projects on screen. Tornatore weaves a narrative fool of wistful yearning and almost cartoonish humor, blending heart with childlike comedy. The melancholy of somber reflection gives way to memories both tragic and joyful, and Toto's journey is full of numerous ups and downs. In addition to the character's personal story and close friendship with Alfredo, the movie takes on a larger look at Toto's village as a whole, commenting on everything from religion to class structure through the townspeople's various interactions with one another. The most telling and entertaining scenes come in various sequences that observe the group as audience members at the local cinema, capturing all the magic and absurdity of life through their behavior and reactions to the images on screen. A fairly traditional coming of age story, the script ultimately finds a romantic voice, but instead of completely embracing the idealistic "happy ending" qualities of the movies Toto admires, Tornatore instead takes his story down a more bittersweet road, carving a sharp contrast between the merrily scripted world of classic film and the director's own cinematic reality. The film's style ranges from functional to beautifully dense, with images that are elegant and crude, simple and meaningful. Shots of Toto's wide-eyed awe of the projector evoke the innocence of childhood and a dramatic, passionate kiss amidst falling rain echoes all the greatest on-screen romances. One scene that features several characters bidding farewell to a loved one utilizes some strong, formalistic editing techniques, featuring various cuts to close-ups of the family embracing while set to the moody sounds of blowing wind, effectively distilling the emotional core of saying goodbye through images and action. Another wonderfully staged shot includes a woman knitting, and uses the visual of her unraveling string to bolster and enhance the content. Then of course there is the film's powerful closing scene which I dare not spoil for any few that might be unfamiliar with its tear-jerking beauty. Suffice to say, it is among the most wondrous of sequences for any film lover, and sums up the intangible majesty of cinema perfectly through its images and Ennio Morricone's gorgeous score. Despite many strengths, 'Cinema Paradiso' is not without some flaws. The cut featured here is the 121 minute version which is significantly shorter than the director's original vision. While arguably superior to the longer edit, there is sometimes a sense that pieces are missing throughout the story leading to some underdeveloped themes and plot-points. Toto's romance in particular feels a little undercooked and thematically incomplete. The film deals with various emotional and contextual concepts, ranging from friendship, love, loss, reflection, grief, and the power of motion pictures, but in the end it lacks a bit of cohesion between all its various moving parts. Though this is ultimately a very simple story, the movie seems a little confused about what it actually has to say. The ending is among the most poignant ever put to screen, but in many ways it's almost excessively sentimental and manipulative, perhaps masking a lack of legitimate substance behind touching imagery. Still, regardless of these comparatively minor criticisms, the finale is unquestionably powerful and the film as a whole is engaging and insightful. 'Cinema Paradiso' is a tender story of one child's journey through life filled with passion, joy, heartbreak, and a love for film. As Toto grows and changes, his perception of the world around him and the town he once left alters, and images which once brought him joy eventually come to elicit the more complicated and tearful mysteries of a special kind of nostalgia. The kind of deep rooted, primal nostalgia that can make a grown man break down from the mere scent of a once forgotten aroma, the quiet whisper of a half-forgotten melody, or the fleeting glimpse of a dancing, flickering light across a silver screen. 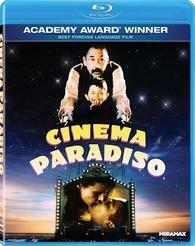 Lionsgate brings 'Cinema Paradiso' to Blu-ray on a BD-25 disc housed in a standard case. After some skippable trailers the disc transitions to a standard menu. Unfortunately, only the edited 121 minute cut is included. While this is the version that won the 1989 Academy Award for Best Foreign Language Film, it would have been nice to also have the original longer cut as well. The packaging indicates that the release is region A compatible. The movie is provided with a 1080p/AVC MPEG-4 transfer in the 1.66:1 aspect ratio. Lacking substantial clarity and depth, this is a fairly underwhelming presentation. The source is in decent shape but there are some specks and very minor signs of damage visible sporadically. Grain is present throughout, but clarity is only average, and the film has a predominantly soft look to it. There is also an occasionally faint, blurry quality evident in facial textures and objects during motion. Since I have not seen the film exhibited theatrically I can't say for certain if this is simply a natural result of the original photographic process (everything from shutter speed, aperture size, and lightning design can lead to such an outcome) or a sign of minor processing, but either way it does hamper fine detail. Colors are a little subdued, but some brightly lit scenes do exhibit pleasing pop and vibrancy. Black levels are a hair elevated in certain shots and contrast waivers a bit, again looking the most impressive in brightly lit sequences. Some minor edge enhancement is also visible periodically. A naturally soft film, 'Cinema Paradiso' just doesn't impress on Blu-ray. Most of the video's less than stellar qualities are simply a result of the original cinematography, but regardless of the cause, this is a pretty flat and average looking transfer. The audio is presented in an Italian DTS-HD MA 2.0 mix with optional English, English SDH, and Spanish subtitles. With average fidelity and minimal separation, this is a pretty basic and unimpressive track. Dialogue is easy to make out, but sounds a little thin, and there is some crackle here and there. Directionality across the two channels is negligible, and there are very few instances of notable separation. Ennio Morricone's beautiful score is as stirring and powerful as ever, but fidelity and dynamic range are less than great, and there is some minor distortion in the music, particularly during the film's tear-jerking climax. Balance between the audio elements is handled well. 'Cinema Paradiso' doesn't sound bad, but the mix does suffer from a few minor technical issues and an overall thin quality. Theatrical Trailer (SD, 2 min) - The film's theatrical trailer is included in standard definition and Dolby Digital 2.0 sound. 'Cinema Paradiso' is a wistful rumination on passion and lost youth. Through its celebration of the recorded image, Tornatore presents a fitting and tearfully nostalgic testament to the magic of cinema. Video and audio are serviceable but unimpressive, and with no supplements this is a pretty lackluster disc. The movie itself is recommended without reservation, but with its bare-bones presentation, this Blu-ray may not warrant a purchase for everyone. Still, despite some shortcomings, it is certainly worth a look.